Bernie, and his wife and coworker Bobbie, who died in 2018, lived in a suburb of New Haven, Connecticut. They have five children and eight grandchildren. Bernie and Bobbie have co-authored their children, books and articles. Their home with its many children, pets and interests resembled a cross between a family art gallery, museum, zoo and automobile repair shop. It still resembles these things, although the children are trying to improve its appearance in order to avoid embarrassment. In 1986 his first book, Love. Medicine & Miracles was published. This event redirected his life. In 1989 Peace, Love & Healing and in 1993 How To Live Between Office Visits followed. He is currently working on other books with the goal of humanizing medical education and medical care, as well as, empowering patients and teaching survival behavior to enhance immune system competency. Bernie’s realization that we all need help dealing with the difficulties of life, not just the physical ones, led to Bernie writing his fourth book in 1998 Prescriptions for Living. It helps people to become aware of the eternal truths and wisdom of the sages through Bernie’s stories and insights rather than wait a personal disaster. He wants to help people fix their lives before they are broken, and thus not have to become strong at the broken places. Published in 2003 are Help Me To Heal to empower patients and their caregivers and 365 Prescriptions For The Soul, in 2004 a children’s book about how difficulties can become blessings, Smudge Bunny, in 2005 101 Exercises For The Soul and out in the Fall of 2006 a prescriptions for parenting book Love, Magic & Mud Pies. 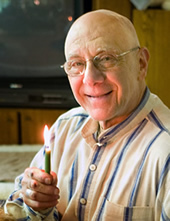 Published in 2008 Buddy’s Candle, for children of all ages, related to dealing with the loss of a loved one, be it a pet or parent, and published in 2009 Faith, Hope & Healing with inspiring survivor stories and my reflections about what they teach us. Also out is Words Swords, my poetry and chance to write and react with your own. In the Fall of 2011 A Book of Miracles was published with amazing stories and my comments. In September 2013 my book The Art of Healing was published containing 60 drawings by patients and what they reveal. Out in November of 2015, Love, Animals & Miracles containing heartwarming inspiring and informative stories about animals, people and life.